Ayo Dosunmu maneuvers between a pair of Golden Gophers during Illinois' 95-68 win, Wednesday in Champaign. 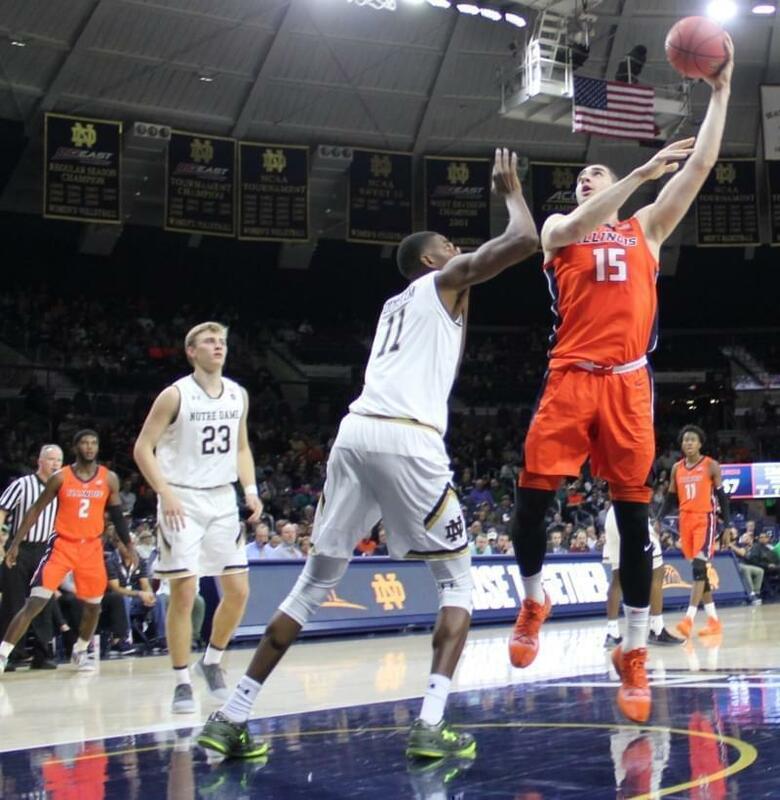 The Illini men's basketball team hadn't won a game in over a month. 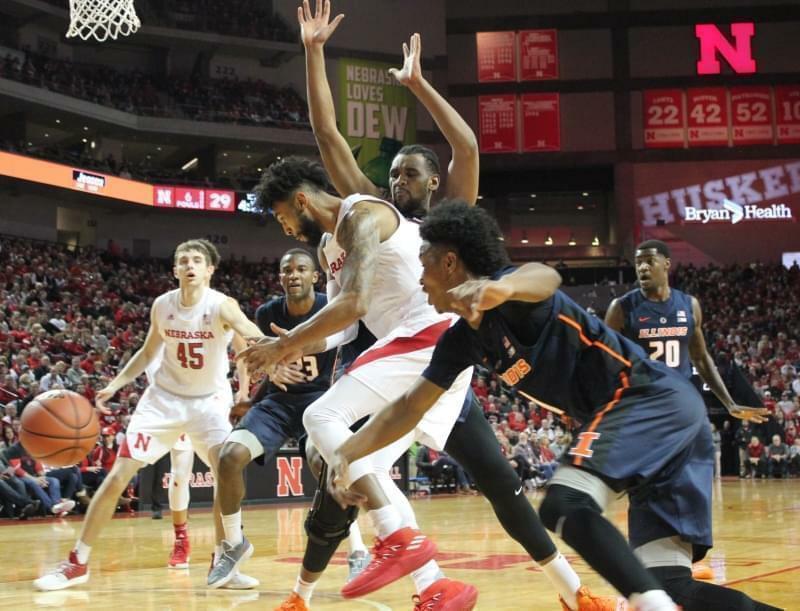 Wednesday night in Champaign, they got their first Big Ten victory of the season, and it was a blowout. Ayo Dosunmu tallied a game-high 23 points. 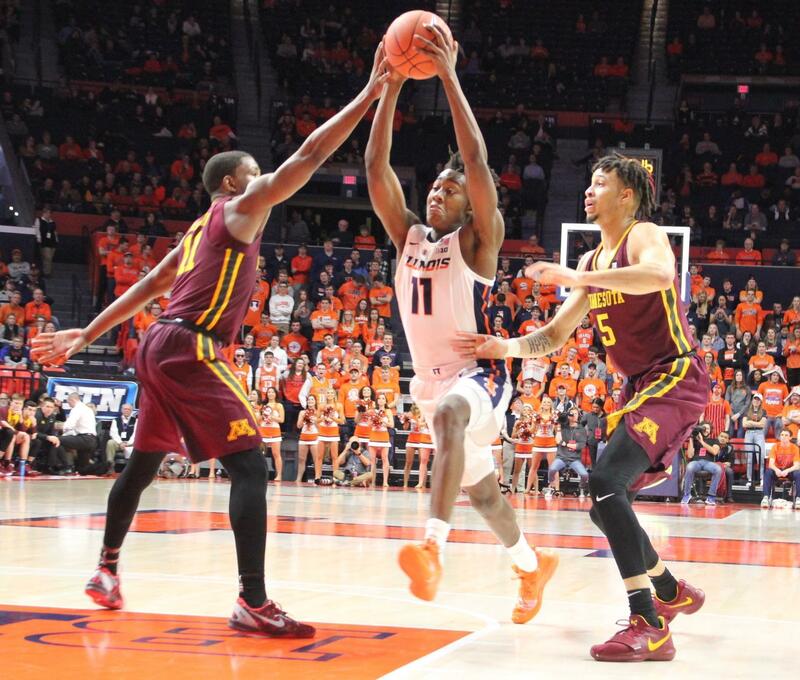 Giorgi Bezhanishvili scored 20 and grabbed 8 rebounds, and Illinois sailed past the Minnesota Golden Gophers 95-68. Dosunmu said it was a long time coming. "I feel like we (were) in every game we played in conference so far, so it was great to finally get that monkey off your back, and just get the first conference win,” he said. 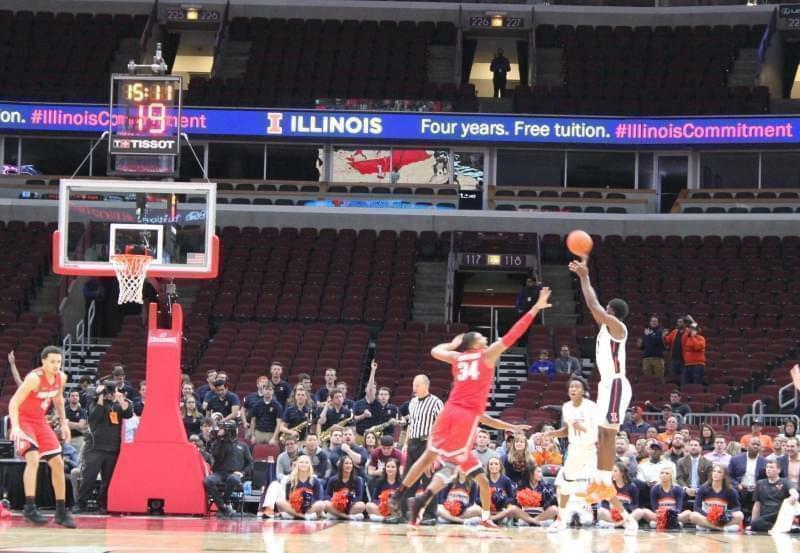 More surprising than the score was the rebounding margin, which Illinois won 39-26. The Illini held Minnesota's Jordan Murphy, who ranks 4th all-time in Big Ten rebounding, to just three boards. Bezhanishvili said it was the focal point of the game plan. "Coach (Underwood) wrote us little cards before the game," he said. "My personal goal was rebounding. I think on almost every card he wrote 'rebounding.'" Coach Brad Underwood said it finally felt like his team was executing on both ends of the court. "From an offensive standpoint, our tempo, our pace was terrific," Underwood said. "We talked a great deal coming in about rebounding." Upperclassmen Aaron Jordan and Kipper Nichols each played less than a half, and sophomore Da'Monte Williams replaced Jordan in the starting line-up. Jordan responded with 3-4 from three-point range for 9 points, plus five rebounds and two assists. 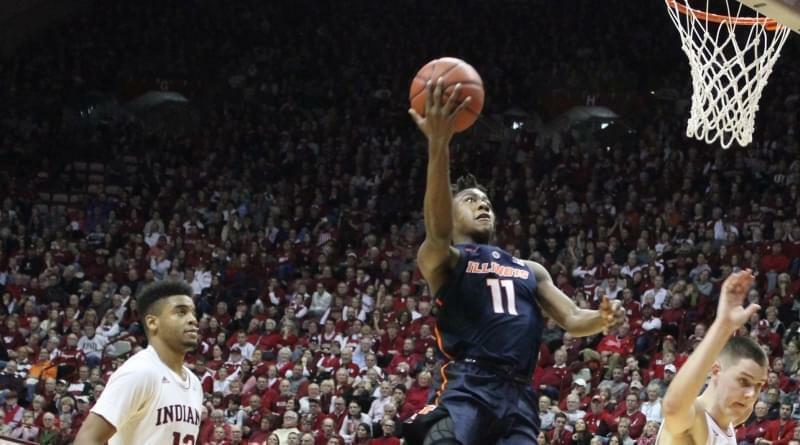 Trent Frazier scored 15 points for Illinois, and Andres Feliz added 10. Daniel Oturu led Minnesota with 17 points and 8 rebounds. Murphy added 11 points. The Gophers had won 7-of-8 prior to Wednesday's game. They're now 13-4 overall, 3-3 in the Big Ten. 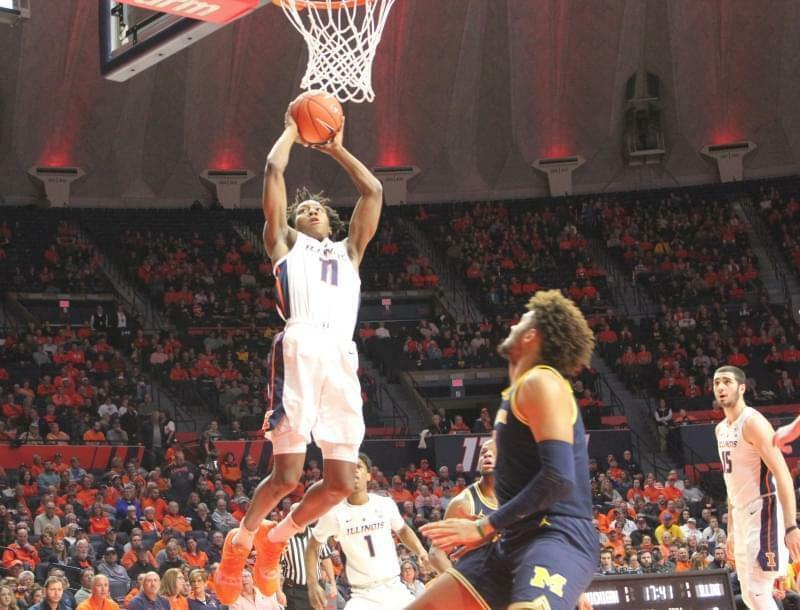 The Illini are now 1-5 in conference play and 5-12 overall. They'll next play at Iowa, Sunday at noon.